VIETNAM/BOSTON - February 28, 2019 - For years, they have suffered terribly as bile bears on a Vietnamese farm in Xuan Loc district (Dong Nai Province), and their rescue was so close. But shortly before FOUR PAWS was able to bring the four bears to its BEAR SANCTUARY Ninh Binh, the animals died inexplicably. FOUR PAWS International, the global animal welfare organization that rescues and takes-in bears all over the world, was in negotiations with bear and farm owners across Vietnam. The owner of these bears had agreed to hand over the animals to FOUR PAWS voluntarily. However, when FOUR PAWS staff visited his farm in mid-February to confirm the animals are healthy enough for transport and rescue, in the presence of local authorities, they found one female bear dead. Her gall bladder and liver had already been removed. These organs sell for high prices on the black market. 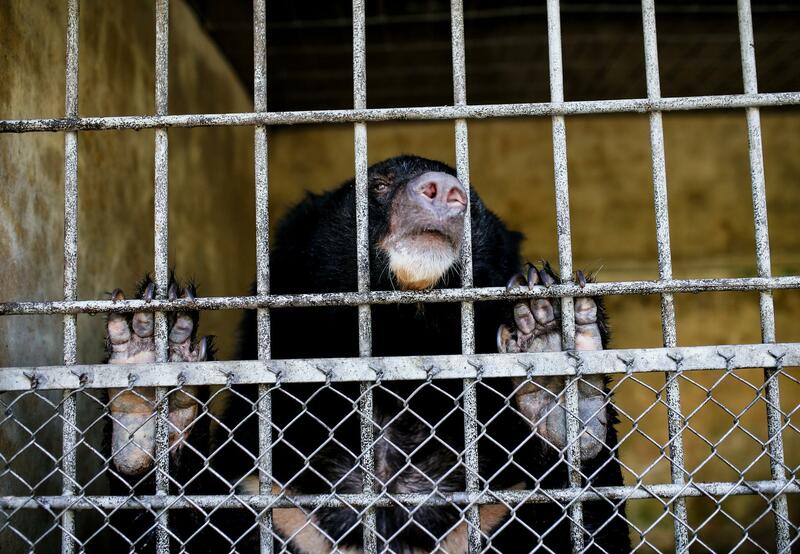 Although the Vietnamese government has repeatedly announced its intention to close bile bear farms, an estimated 800 bears on some 250 bear farms are still suffering in appalling conditions. Most of the bears are malnourished, dehydrated, neglected and at risk of being killed by their owners, all because the illegal trade of organs such as the gall bladder or liver is a booming business. In the study "The challenges and conservation implications of bear bile farming in Vietnam,” the organization Free The Bears interviewed sixty-six bear farmers. Sadly, half of the farmers said that if the farm was closed, they would not be afraid to kill the animals. Next Thursday, FOUR PAWS will officially open the BEAR SANCTUARY Ninh Binh in Vietnam. Located in Ninh Binh Province, the new bear sanctuary will cover roughly 25 acres of land and will allow a total of one hundred abused bile bears to live peaceful and species-appropriate lives in natural enclosures. Ten former bile bears are already living there, as well as two bear cubs saved from the illegal wildlife trade. The bear sanctuary, which was built according to the most modern keeping standards, with its own veterinary clinic, two bear houses, a quarantine station and four outdoor enclosures, currently has thirty-two free places for rescue bears, and by the end of the year, a total of over seventy animals could be given a nice home there. Bear bile has been considered a remedy in traditional Chinese medicine for several thousand years and is used to treat eye diseases, haematomas, digestive disorders and other ailments. Although its effect is doubted even by renowned experts of traditional Chinese medicine and there are much better herbal and synthetic alternatives, it is still a sought-after product in many Asian countries today. Although the possession, sale and consumption of bear bile has been banned in Vietnam since 2005, animal husbandry is still permitted. Many bears continue to be illegally bled and the illegal trade in bear bile continues to flourish on Vietnam's streets, in TCM shops, on bile bear farms and on the internet. FOUR PAWS International, through their global effort called Save the Saddest Bears, aims to end the private ownership of bears on Vietnam bile farms and end the cruel trade of bear bile in the region through their efforts in advocacy, public education, rescue and refuge.